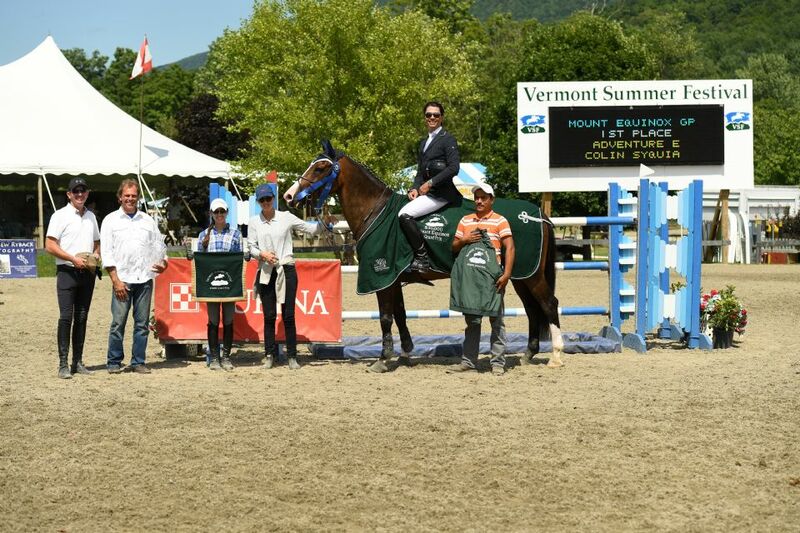 East Dorset, Vermont – Colin Syquia of Forest Hills, NY, and Adventure E, owned by Eurasia, Inc., won the $30,000 Mount Equinox Grand Prix, presented by Purina Horse Feed, on Saturday, July 30, during week four at the Vermont Summer Festival in East Dorset, VT. The Vermont Summer Festival runs for six consecutive weeks from July 5 through August 14, 2016, at Harold Beebe Farm. Purina Horse Feed, on July 30 at the Vermont Summer Festival in East Dorset, VT.
Syquia and Adventure E have been knocking on the door of a grand prix win all season and finally led the victory gallop on Saturday after topping a field of 21 horses over courses set by Canada’s Michel Vaillancourt. Syquia and his nine-year-old Dutch Warmblood gelding (Damiro x Calvados) were second during the week three grand prix and batted clean up in this Saturday’s jump-off to take top honors. Before Syquia entered the ring as the last trip of the jump-off, Jeffery Welles of Wellington, FL, sat in the lead aboard Broken Heart, owned by Herbert Sambol, with a clear jump-off effort in a blistering 37.32 seconds. Syquia, however, put Adventure E’s speed to good use and stopped the clock in 37.09 seconds to bump Welles to second. Marylisa Leffler of Brookeville, MD, piloted Bling Bling to a double-clear day in 38.01 seconds to finish fourth for Rolling Acres Farm. Joe Fargis of Middleburg, VA, and Honolulu 111, owned by Tracey Weinberg & The Weinberg Brokerage Group, had a time of 39.76 seconds for fourth place, while Karen Foley of Wilton, CT rode her own Ideal S to a time of 41.56 seconds to cap the top five. Syquia got the ride on Adventure E three years ago and has been campaigning the gelding toward top-caliber sport ever since. Syquia has been introducing Adventure E to a lot of firsts over the past several months, including his first night class, first 1.55m class, and first 1.60m class, but after pocketing the gelding’s first grand prix, he hopes consistency will soon follow. Syquia and his own Eurasia, Inc. wrap up two weeks at the Vermont Summer Festival on Sunday and have enjoyed many high points in the hunter and jumper rings. Vermont Summer Festival, as well as groom Abel Maximo and Eurasia, Inc. team members. After his win, Syquia was presented with a cooler from Mona’s Monograms and an equestrian-themed belt from Oughton Limited. In addition, the Vermont Summer Festival honored his groom, Abel Maximo, with the weekly Grand Prix Groom Award. In recognition of Maximo’s hard work preparing Adventure E for grand prix competition, he was honored with a monogrammed jacket and coolerette from sponsor Glenn Geary of Horsewatch. In addition, Chloe Field of Jupiter, FL, earned the Kastel Denmark Ladies Style of Riding Award for her performance in Saturday’s grand prix. For over 20 years, the Vermont Summer Festival has attracted exhibitors and their families to the Manchester region in southern Vermont for great competition in an ideal summer setting. Outside the show ring, exhibitors enjoy the charm of Vermont’s shopping, dining, and outdoor activities. Competition at the 2016 Vermont Summer Festival runs weekly from Wednesday through Sunday, beginning each day at 8 a.m. Admission is $6 for adults and $3 for children from Wednesday through Friday. On Saturday and Sunday, admission is $9 for adults and $5 for children with 100% of all gate proceeds benefiting the Manchester Community Library, Dorset Equine Rescue, and Meals on Wheels. Please e-mail or visit www.vt-summerfestival.com for more information about the Vermont Summer Festival.